An ambitious conqueror who isn't sure why she's been sent here, but has the impression only that she is to claim the island for her own and await her master. She's not interested in others beyond using them to further her own selfish gains, and will easily dismiss anything she doesn't see as an asset in some way. To Astyn, one's worth is only as good as they can back up with tooth and claw--ferocity is the main way to capture her attention. While she is typically easily provoked by attacks on her ego or her purpose, she's not as easily goaded into a fight by those she has deemed useless. Astyn will almost always fight first and talk later, pausing only with those she feel might be valuable. Her trust is best-gained through battling. A sore loser, she will strike out for vengeance at any chance she gets when she is defeated, proving a constant threat. She's a fan of marking those she's made submit to her--when she fights, she will frequently try to leave a lasting mark in order to cement her dominance over them. While usually fairly straightforward, she can also be very sly. When she meets something that piques her interest, she will try to gauge the most efficient way of making them useful to her; sometimes this is with boldness, and sometimes this is with honey or patience. The Salazzle is good at deceiving others in order to further her own ambitions, and will pick and choose where to do so according to the context. She's never afraid to do her own dirty work. When alone, she is quiet and eager, always searching for the next opportunity. Astyn sleeps with one eye open and never quite trusts people enough to give someone the opportunity to backstab her. There are times when she reflects on her lost history with anger, and other times when she reflects on it with sadness, and with a longing. Despite being a fire type, she often returns to the sea, searching for the part of her that completes her longing for the King who is missing in the equation, certain that whatever it is will come for her eventually. Astyn was a Medieval king's wardog in Orre. 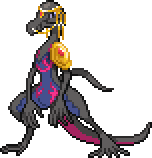 She and her force of Salandit would be sent ahead of the King's human soldiers to clear the territory of threats, razing villages and supplies in her wake to weaken enemy forces. Rumors often preceded her, of the way her poison melted through steel weapons and armor like they were nothing. She was a prized warrior, equally revered and feared in the King's palace, and has never lived anywhere else other than the top. She and her forces were on a warship to another territory when a violent storm seared the ship with lightning, sinking it to the ocean's depths. Astyn would wash up on Mautte only a day after. Mautte took away her memories, but not the instincts that were bred into her. Corrosion: Astyn's unique poison is so potent that it can harm steel and other metals, and can even affect other Poison types that would usually be resilient to them. Appearance: Her body is that of a regular Salazzle's, though she's larger than usual, coming up to about 4'6 in height. Her head is adorned an intricate headpiece crafted from threaded gold. Its main loop stretches about her skull, holding a gold amulet set with a ruby that rests at her forehead. Two golden cords dangle from each side of the headpiece's sides, and a third on both side loops to a ring hooked through each of her nostrils. The ring's ends are overlapped to form its shape, allowing her to easily detach both of them during battle and let them dangle at her neck. On her left shoulder, fastened with a leather strap about the arm, is a shoulder plate of armor. Its form is in the shape of a spiral, curling inward around an inlaid large ruby. It is decorated with smaller, more intricate markings that are similar to her species' underbelly flame patterning.